Regular hygiene therapy visits and proper diet, daily brushing, flossing, water pik use and mouth rinsing are imperative to maintain your oral health. Take proper care of your teeth and gums not only to prevent tooth decay and tooth loss but to also help prevent the development of serious health issues in the future. Like Dr. Mundt says “The more you do at home the less we have to do at the office.” At our office we appreciate your honesty and we try to work with what you feel you can and will do, what works for you and we will always encourage you to continue what you are doing already to help us with your oral health. We like to evaluate your technique and suggest what may work better for you. We can accommodate more than one family member at the same time for recare exams and cleanings for couples or families to be more efficient with your family’s time. We offer to treat mouths in portions for those who cannot handle longer appointments or their jaw needs shorter visits. We offer desensitizing with Oral Science’s Xpur Crystal before and/or after your scaling. We can do freezing or numbing, no injection anaesthetic rinses, and no injection intrapocket anaesthetic for your care and comfort. 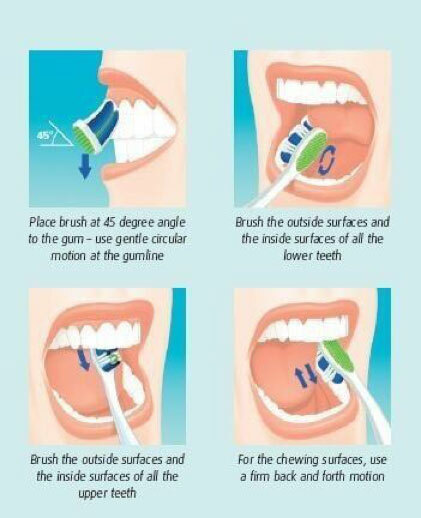 Our hygienists are able to hand scale and/or use the water spray cavitron to remove your tartar. We now offer no tray fluoride applications. This paint on fluoride varnish is the most effective fluoride treatment uptake for your teeth and you can eat and drink right after so there is no wait after your application. During your cleanings we try to make you comfortable with a few added comforts. We offer blankets (some are heated), dark sunglasses, neck and knee pillows, TVs in the ceiling with headphones (some are noise cancelling) or ear plugs to block out noise, massage treatment chairs as well as monitor you for your comfort. 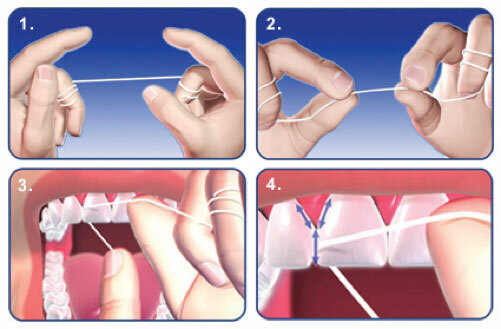 Below are visual aids on how to properly care for your teeth. If you have any questions about any at home therapies please contact us for more information.